The world itself it limitless, there are endless things you can learn on a daily basis, do not let yourself get confined to a box. I say this speaking from experience, as I was confined to a box or boundaries on my designs. Now, I have no limits. I created the below with inspiration from this YouTube video. I took the basic shape from him, just learning more about working with shapes to make the tools work for you, then I expanded his design with different gradients, reflections, and even added in an additional box. Hope you like it, I do. After being at a full time job for nearly two years, I am once again back in the job hunting and freelancing game, by my own choice. I have gained a wealth of knowledge that will help me advance with whatever life throws at me, however, I am still somewhat apprehensive. I do not know what tomorrow holds, it could hold a job offer, a client, or a winning lottery ticket. Regardless, it’s time to abandon hope and just make things happen. I have already dove in head first into expanding my knowledge of jQuery, along with watching countless Illustrator tutorials. 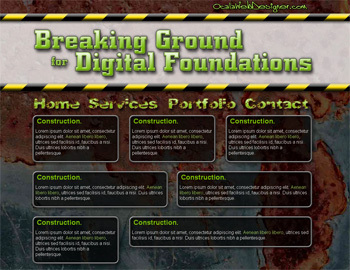 This site, along with Ocala Web Designer will be getting facelifts following the cutting edge of the latest web trends. That’s all I have right now, time to get crackin’. I’ve been busy with all kinds of things. One of those things includes a redesign of my site for Ocala Web Designer. It’s not that I didn’t like the last design, it’s just that it wasn’t clean enough to be a site promoting web design. The new site is sleek, streamlined, and might purty…sorry, couldn’t help throwing that in there. Unfortunately, I didn’t make an IE6 version, though I probably will. It will probably just have a pop up informing the user to upgrade their browser and that the site wont look pretty until they do. So, I’ve been reading a book on object-oriented code for PHP, for the second time. Why the second time? Mainly because the author doesn’t write for the average Joe, he uses many words that are just too large and over descriptive for the point he is trying to get across. I am, however, further along than I was previously. It’s amazing, I’m on chapter 6 in a book about code, and the author hasn’t asked the reader to do any examples yet. All that’s been given are non-functional examples, it’s no wonder I didn’t make far last time. Once I finish, though, I plan on rewriting my blurbs.info site in OOP to put my knowledge into real-world application. Just about 150 more chapters to go (not really).